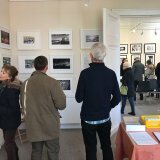 Sidmouth Photographic Club's highly successful week-long Member's Exhibition came to a close last Sunday. The Club had held an open evening on Monday 20th November to officially kick the event off and this was extremely well supported. 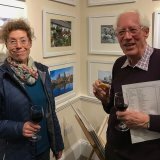 The Guest of Honour and wife of a founding Father of the Club; Harold Fish was in attendance and heard Club President Chris Rourke formally announced the Exhibition open. Mrs Fish (pictured) was presented with a bouquet of flowers and said a few words to the assembled gathering, wishing the Exhibition all success. A display of photographs and a narrative providing some history of Mrs Fish's husband Harold and two further original club founder members was on display. The club had in excess of 75 prints from its club members on display around the walls of Kennaway House. These were enjoyed (and some were purchased) by the many visitors the free Exhibition had received throughout the week. A raffle was held in order for someone to win a framed print of their choice and this was won was Julie Sorrell from Sidmouth. 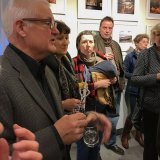 In addition, the club held a week long vote for visitors to express their favourite image of the Exhibition. In this competition Julian Shaw LRPS was the winner with his print titled "Morning". A lot of planning and hard work had gone into putting the Exhibition on at Kennaway House and its success was fitting recognition of the club's 80th Anniversary. The club and its Committee and Members would like to thank all those who attended, as without your support the event would not have been the success it was. 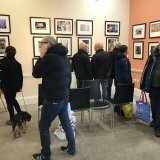 Below are some images from the Exhibition.